"Will Go a Long Way to Eliminating this Concern from Your Life"
If you're an old guy interested in younger women I recommend you get this interview. It is a great product, and will eliminate this concern from your life if applied correctly. 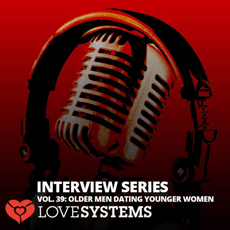 This audio covers the subject of older men dating younger women very well. It looks at the mindset you require, situations you may come across, how to modify your approach towards younger women to play to your strengths and avoid your weaknesses. A very practical product. "The girl has to be mature enough to be with you... not you having to be young enough to be with her." The one area I would've liked to see more content on is testing from women about your age. This is probably the biggest fear of older guys when it comes to approaching younger women. What if she tells me I'm too old for her? What if she asks me why I'm talking to someone so young as her? There wasn't enough practical examples on this, it was touched on very lightly and there was discussion around the topic in a non-detailed way. Given how high it is likely to be on most guys 'learning agendas' in this area. Everything Savoy pointed out and commented on in this audio was 'spot-on'. Great advice. However, there were instances where the input from Kisser was a bit off - slightly random comments that are more relevant to his individual experiences than applicable to the old - young women dynamic specifically. Be aware of this, especially when Savoy comments on what Kisser has just said. If you're an old guy interested in younger women and not sure how to approach it or worried about it I recommend you get this interview. It will change the way any guy without a lot of experience in this area thinks and set him straight on many details. It is a great product, and will eliminate this concern from your life if applied correctly. $40 may sound a lot for an audio of less than an hour, but the content has the ability to really eradicate this concern from you life - that's pretty good value for money in my book. But good summary otherwise, tanks-es.